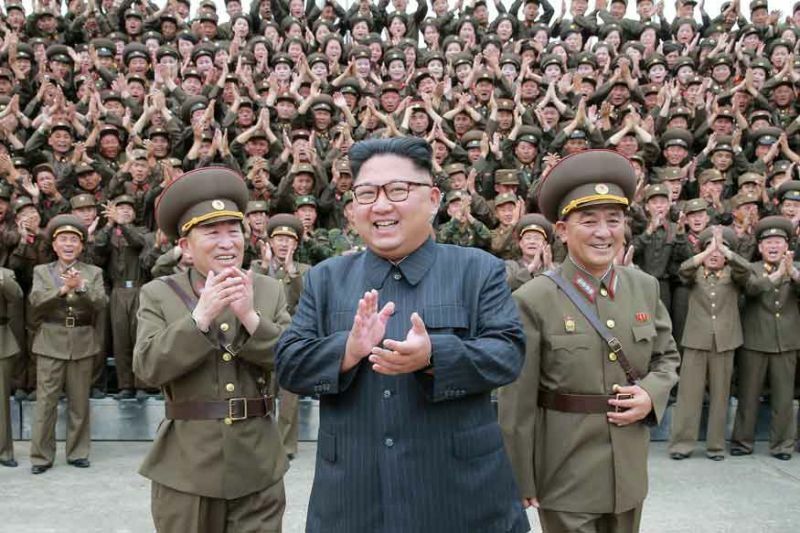 SEOUL: North Korea staged a military parade in Pyongyang Thursday, Seoul said, in a show of strength just a day before the Winter Olympics opens in the South. The nuclear-armed North is on an Olympics-linked publicity drive – sending a troupe of performers, hundreds of female cheerleaders, and the sister of leader Kim Jong-un to the South. In recent days, thousands of troops and hundreds of armoured vehicles have been seen rehearsing for the display in the capital. Analysts say that with the dual approach, the North is looking to normalise its status as a “de facto nuclear state”, and could be trying to weaken sanctions against it or drive a wedge between the South and its ally the US. North Korea is under multiple sets of UN Security Council sanctions over its banned nuclear weapons and ballistic missile programmes, which have seen it develop rockets capable of reaching the US mainland. Pyongyang last month announced it would commemorate the 70th anniversary of the founding of its military on February 8 – changing the date from April 25 and switching it to the day before the opening ceremony for the Games in Pyeongchang. North Korean military parades typically feature thousands of goose-stepping troops and hundreds of armoured vehicles, culminating with missiles rolling through Kim Il Sung Square – the highlight for Pyongyang-watchers who examine them for clues about the progress of its technology. But none of them have spotted in satellite imagery ahead of the parade, according to respected US website 38 North. Pyongyang normally invites hundreds of foreign journalists to show off the spectacle to the world but did not do so this time, possibly an indication that it wanted to control how the display was seen – which would be in keeping with the absence of live coverage. The North’s high-level delegation for the Olympics are being led by its ceremonial head of state Kim Yong Nam, the highest-level official ever to visit the South, and also includes Kim Jong-un’s sister Kim Yo-jong – an increasingly powerful and influential figure. The delegation will travel by plane on Friday, landing at Incheon airport near Seoul, the Unification Ministry said. US Vice President Mike Pence was due in the South later Thursday and is also scheduled to attend the opening ceremony in Pyeongchang on Friday. That could put him in the same room as Kim Yong Nam at a leaders’ reception beforehand, raising the prospect of senior figures from the two sides meeting after a year in which their leaders traded personal insults and threats of war. Earlier Thursday a senior foreign ministry official Cho Yong Sam, was quoted as saying the North had “no intention” of meeting US authorities during the trip. “We have never begged for dialogue with the US and will never do so,” he said. But his comments did not rule out a meeting – and nor has Pence. The US vice president has lambasted the North, announcing in Tokyo on Wednesday that the US would impose its toughest sanctions to date on the regime. The US “will not allow North Korean propaganda to hijack the message and imagery of the Olympic Games”, he said. But on his way to Asia, he left open the possibility of meeting any of Pyongyang’s representatives. “I have not requested a meeting, but we’ll see what happens,” he said. The Winter Olympics, which will take place just 80 kilometres (50 miles) south of the Demilitarised Zone that divides the two Koreas, have triggered a rapid rapprochement on the peninsula, although analysts warn that warmer relations may not last long beyond the Games. Tensions soared last year as the North carried out multiple weapons tests, including intercontinental ballistic missiles capable of reaching the US mainland, and by far its most powerful nuclear test to date. For months Pyongyang ignored Seoul’s entreaties to take part in a “peace Olympics” until Kim indicated his willingness to do so in his New Year speech. That set off a rapid series of meetings which saw the two Koreas agree to march together at the opening ceremony and form a unified women’s ice hockey team, their first for 27 years. But critics in the South say Seoul has made too many concessions to Pyongyang, and demonstrators protested the arrival of the art troupe earlier this week. But Pyongyang official Cho insisted: “The reason that our delegation is in the South is to participate in the Winter Olympics and celebrate its successful hosting.